(I first wrote this article for another blog in January, 2013, as Pres. Barack Obama began his second term. Now, we have just inaugurated our 45th president, Donald Trump, as of January 20, 2017. The nation seems to stand divided in ways I, personally, haven't witnessed since the days of the civil rights movements. Is there a solution? 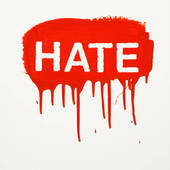 Hate is a strong emotion--stronger than most when it goes deep. It can move individuals, groups, nations to carry out unimaginable destruction and grief. It already has, down through the centuries. It continues today--in the forms of terrorism, racism, sexism, homophobia, child abuse, gun abuse, and more. Those of us who consider ourselves civilized have good reason to be scared. It seems as though there is nothing we can do to halt the growing menace. Our police seem weak, our governments impotent, our borders unprotected, and more and more 'unbalanced' individuals are armed with high powered weapons fit for the military. There's more than hope. And in this two-part series, you’ll discover how you can help bring hatred to its knees. You can and must play a major role in bringing sanity back to an insane world. You have it within you and around you to save this planet and her people, her creatures, her resources. But will you? Or will you succumb to the fear? No need. You will now have the tools to turn on the light. You probably live in a city or town that has community access TV channels. In my city, there are several. The other night, I was flipping through the channels and happened upon a weird little program put on by the so-called Aryan Nation. This white guy, around 30, was spouting about how the White race is superior, how he hated Hispanics and Jews in particular, and what we needed to do to get rid of "the pests." He didn't come right out and advocate murder and terrorism, but it was definitely implied. The guy claimed that the White race had given all its best stuff—technology, literature, music, art—to the inferior races of Asia, Africa and South America. And they had used it all against us. He said that the other races, especially Hispanics, were overrunning the United States and turning it into a Third World country. They only take, he said; they don't really contribute anything of substance. He said that the Jews were using the US to perpetuate their own agenda, that is, to totally control the Middle East. They take American money from American banks, that is, American pockets, to finance their covert operations around the world. Then, in a final bit of rage, he declared war on Islam. The Muslims, he claimed, were pouring into the US and setting us up for the internal War of Wars. They were planning on bombing everything possible to bring the US to its knees. Then, when it was weakened, the Muslim groups from outside the US could come and take control, demolishing American democracy—and thus, the democracies all over the world—while setting up an Islamic theocracy in its place. Growing up in the 1950's, I encountered a lot of racism. Most of the kids I went to school with were White, and they thought nothing of telling racist and sexist jokes. Me, too, I'm afraid. It didn't matter; it wasn't important. We were not told that Black people, Hispanic people, and Asian people were actually part of the human family. Oh, we knew they were human in a sense, but they were different from us, less educated and educable; they were dirty, and caused most of the crime in our cities. They came in from foreign countries and stole jobs from White people. And you didn't want your daughter or sister or even son to marry one. Did our schoolteachers seek to enlighten us with the truth? Did they tell us that these other folks who seemed so different were actually the same as us, with dreams and hopes and fears? Did they admonish us to treat people who appeared different with understanding and friendship? Most of the teachers and administrators—and our parents—were as prejudice as the kids. That's where we got it. And what about our ministers? Once in a great while, I would hear a preacher mention that we should be "tolerant" of our darker brothers and sisters, but for the most part, I rarely heard any truly loving language concerning racially different people coming from the pulpit. And most of those preachers would never allow a “mixed marriage” to take place in their church. Has all that ended? Perhaps to a small degree, but not completely. We still carry a great deal of prejudice in our collective hearts. It may seem subtle, but not to those who are still the recipients of it. And it's not just White people who are prejudice. Americans of every stripe carry seeds of racism, sexism, homophobia, even ageism. You don't have to be Caucasian to be mean-spirited. Now, with all the terrorism reports, all the bombings and shootings in London, New York, Baghdad, Kabul and Egypt plus Tucson, Aurora, Portland*, and Newtown, more and more people are allowing the old prejudiced mindset to return. "Kill all the Muslims,” read a sign in downtown Portland and recently. Are the Muslims to blame for all the world's trouble? Of course not. There is a handful of radicals who are claiming that they kill in the name of Islam, to destroy the enemies of Islam, to protect the good names of Allah and Muhammad. But the vast majority of Muslims, like the vast majority of Christians, Jews, and Hindus, are peace loving, hard working people. They want the best for their children, for their neighborhoods, for their nations. A few misguided fundamentalists, who believe they are doing God's will, are actually setting the world up for a possible letting of blood unlike anything we have ever experienced in world history. And no one, including the radicals, will win. Can we change that scenario? Do we even want to change it? If we can, how? When? With what? You will learn how in Part II. You don't want to miss it. You play a major role. *Add San Bernardino, Paris, Brussels, Istanbul, Berlin, Charleston, Nice, Ankara, Orlando, and more since this article was first penned in 2013.